The more I visit companies the more I realize how profoundly lacking most of them are in the area of documented standards and procedures, to say nothing of Standard Work. As one of the cornerstones of the Toyota Production System, Standard Work (also Standardized Work) is very different from standardization or work standards. Standard Work is a very exacting thing. It is typically represented on a Standard Work Sheet showing the layout, material flow, people and inventory as well as quality and safety checkpoints, and the Standard Work Combination Sheet showing the steps for one person to complete one cycle of work and all associated manual, walk, wait and automatic times. The definition of Standard Work is “the most effective combination of manpower, materials and machinery”. Standard Work is the method, and thereby you have the four Ms of manufacturing (manpower, material, machinery, methods). Standard Work is only “the most effective” until the standard is improved. This is done through a continuous process called kaizen. There are three elements to Standard Work for a repetitive process. They are 1) takt time, 2) work sequence and 3) standard work in process. For a process that does not repeat or is too variable it may not be possible to establish Standard Work according to these conditions (takt time is not meaningful, work sequence varies, Standard WIP varies). In this case, eliminating the variability or standardizing the process and creating a repetitive flow is the first step in kaizen. Ultimately all work you do is the same, and when you understand this deep Zen of Lean everything else you do will become much easier, though the pace of change will seem to slow down in your new awakened state. If you are scratching your head at this point and wondering what I could possibly be talking about it’s a pretty good sign that you have huge opportunities at your company by implementing Standard Work. As I said above, it’s similar but very different than having standardization, work standards, or standardized work instructions. The two requirements for working in a truly Lean enterprise are 1) follow standard work, and 2) find a better way. There must be more to it than that, I hear you say, and you are right. For most of us who lack Standard Work, there certainly is more. First we need to establish the standards. Then we need to train people to these standards. Then we need to audit and verify that these standards are being followed. 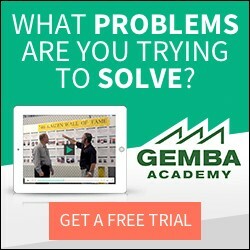 Although most of the people at Gemba have spent a significant amount of time working in factories, Gemba is not a manufacturing company. We can’t claim to be the peers of our clients or know exactly how it feels to implement Lean manufacturing. We do try to apply as many of the philosophies and disciplines of Lean and kaizen as we can to our own company. Yet as vital and fundamental as Standard Work is, we are as guilty as our clients in making excuses when it comes to committing the resources to establishing and living by it. I am hereby making a renewed personal commitment to establishing Standard Work at Gemba. Perhaps I will let you know how it goes. Standard work is something I write about frequently (I’m midway into a 20 part series). Designers -who can resent any workstyle other than an intuitive approach, thinking it impinges on their creativity- seem to have taken well to it. Since designers drive the product cycle, I can only think that more detail/specifics regarding the nature of what constitutes standard work, is what has helped with acceptance of the need to adopt it. While my background is manufacturing, I don’t manufacture either but I started to kaizen my shipping procedures to develop standard work and I’ve cut my order processing time by over half. I’m pleased. Hi my company has recently embarks on lean. i heard something about standard work. How do you document standard work? Is there any particular “standard” documentation format that is commonly used? They are the same thing. It was called “standard work” by the Japanese consultants from the Toyota supply chain who were teaching TPS overseas long before Toyota made TPS popular, so many people who learned their lean terminology between 1988 and 2004 or so call it “standard work” and TPS consultants who come directly from Toyota tend to call it “standardized work”. How do you get your time values and how do you know that they are standardized? You sure can’t just take any observed time. There are all kinds of factors that have to be considered. I would think that MOST might work here, but I have not seen anything that supports this requirement for Standard Work in any article yet. I would appreciate someone’s comments. That’s a very good question. I think there is a reason why MOST isn’t often mentioned in articles about standard work. You can find my reply to your question at Ask Gemba. The definition of Standard Work is “the most effective combination of manpower, materials and machinery” is simply perfect! Some people only take notes of the operations, and document them. I call it “documented work” only. Standardized work aims at the best practices. Moreover, whenever something changes, the documentation should be reviewed to reflect that change. Do not forget to get all people’s approval before going ahead. I like the formula: “STD Work = Continuous Improvement”. When I audit the production floor, a signal that the team members are practicing it is to check the initial date vs. the last revision date of the docs (it is a hint of CI). I do not have as much experience on STD Work, but I’ve learned form practice, that is a must to make small improvements before writing the documents. I love this article. In am currently a part of an organization implementing Kaizen… I am struggling with what appears to be a lack of “standard work” for facilitation in our current Gemba project led by our Sensai. Each meeting seems incongruent and difficult to follow from one day to the next. For someone with a strategic bent like me… I find this hard. Gemba Keiei Chapter 18: Supermarket System	What is Lean Government?